Bella casa di tronchi di livello Tri situata su diversi ettari privati ​​con il suo lago non motorizzato. Cucina ben attrezzata, accogliente soggiorno, zona soppalco ideale per i bambini giocare, lavanderia, 3 camere da letto (King, Queen, 2 letti singoli e futon), 2 bagni, ampio bar e area di raccolta con patio sciopero, ideale per grigliare. Spazioso avvolgente portico con molti posti a sedere. Un grande prato ben curato offre splendide viste sull'acqua e sulle colline circostanti. Se ti piace la privacy questo è il posto giusto per te. Famiglia ideale da scappare o perfetto posto per la luna di miele. Ottimo posto per i bambini, un sacco di prato per correre, molte attività previste. Non sono ammessi animali o fumo. Cucina completamente attrezzata con lavastoviglie, microonde, caffettiera, tostapane e tutti gli utensili e i piatti necessari. 3 camere da letto, 8 posti letto, 2 bagni completi, lavanderia con lavatrice e asciugatrice, 3 TV a schermo piatto (TV satellitare), Internet e lettori DVD, area giochi interna per bambini, bellissimo bar per rilassarsi intorno e ampio portico con posti a sedere, patio esterno e grigliate, lago per pescare (prendere e rilasciare) o provare a fare kayak o andare in canoa. A ferro di cavallo e fuoco buca e un sacco di parcheggio. Ambiente tranquillo è ideale per rilassarsi o per godersi la vita all'aria aperta. Excellent cottage in a wonderfully serene, natural setting. Immaculately clean and well appointed. All the amenities you would need and everything worked well. Owners are conscientious and pay great attention to detail. Tons of wildlife for your watching pleasure. Lots of room for 6 adults to spread out, or be together, as we chose. We stayed here as it was close to our daughters wedding venue. It was perfect for us. There was plenty of room for our family and everything that you could need is there. Toys for the little ones, outdoor games, and fishing ! The house is beautiful and the beds are so comfy. It may sound odd but it feels like the house itself is welcoming you. The owners are such nice people and we loved the s’mores welcome gift! We will be visiting again. 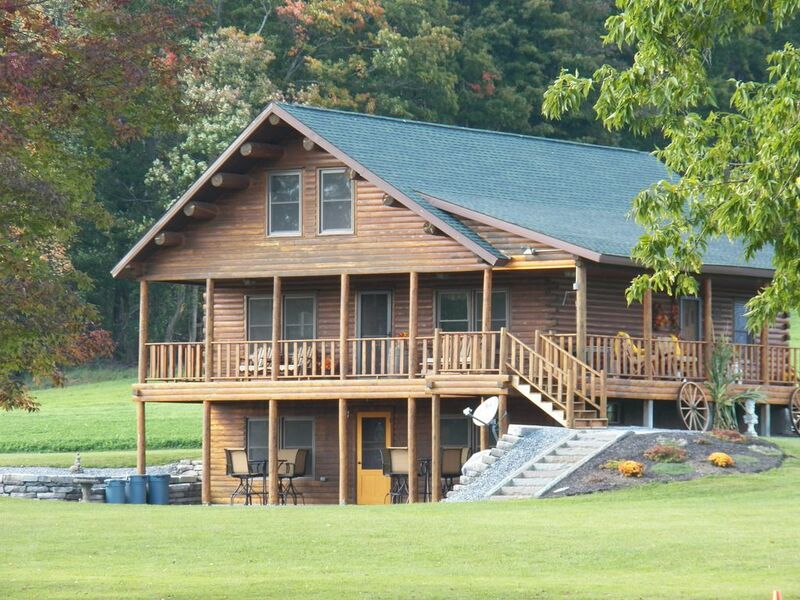 Beautiful log home in a serene setting!! Like a postcard!! Our stay at Ray’s Rustic Retreat started on the perfect note! Two deer leaping across the field greeted us as we rounded the bend onto the property! What a stunning place to spend a long weekend with my family. We were in town for a cousin’s wedding and rather than getting multiple hotel rooms, I’m so glad we decided to stay together in a house. This property had something for all three generations of my family to enjoy! My niece and sister especially loved taking the paddle boat for a cruise around the pond! The home was pristine with every possible need addressed. The beds were super comfortable with what my niece called “the softest blanket ever!” The kitchen was better supplied than my own home! Every light switch was labeled and all technology had a cheat sheet for operation. You thought of everything! We had two lovely dinners at Michael’s down the street, an elegant restaurant with wonderful service and delicious food! A 45 minute drive through beautiful pastoral scenery took us to the Baseball Hall of Fame for a fun family afternoon. All that being said, the highlight of this property for me was sitting on the porch in the most comfortable glider ever taking in the view. Rolling hills with just a hint of fall color, the trees reflected in the pond, the heron swooping by, the golden corn fields... so peaceful! I highly recommend this property and can’t wait to return! 2nd time staying here and it was a wonderful 5 days. All the amenities you can ask for and wonderful owners who have provided a great, peaceful retreat. Can't say enough about the place, a must rent if looking a vacation rental in the area. 10 acri da esplorare a piedi. Provate a pesca nel lago (cattura e rilascio) o kayak e pedalò. Colgate University e Hamilton College entro 15 miglia. Città di Utica 20 miglia di distanza. Campo da golf driving nelle vicinanze. Turning Stone Casino Resort e Vernon Downs Raceway entro le 20 miglia. Molti campi da golf della zona. Situato in posizione centrale a molte attrazioni.